Purchased by Dr Elio Zagato himself, this is one of seven left-hand drive DB4 GT Zagatos. Zagato specified several unique features like the air-scoop on the engine cover, tubular bumpers and Carello headlights. An accomplished racing driver, Elio Zagato fielded his DB4 GT in several local events. Late in 1961, he had telescopic shock absorbers fitted on the rear axle. Zagato would eventually sell the car on to a fellow Italian in the mid-1960s. The car remained in Italy for at least a decade and disappeared from the radar. It was eventually tracked down by Aston Martin specialist Richard Williams, who then spent a further nine months of negotiating to acquire 0181/L. In 1980, RS Williams completed a ground-up restorations. The next owner was Aston Martin share-holder Peter Livanos and it was later also owned by Tony Buckingham. By the late 2000s, it joined a prominent British stable that also included a Ferrari 250 GTO. 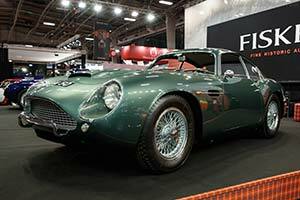 Having used the car in a variety of events, he consigned the car to dealer Fiskens, who showed the car at Retromobile in 2019.